Dinosaurs are such a massive topic of interest for many kids and I can fully understand why – when I was a kid, I was quite a dinosaur fanatic myself and I actually went to see Jurassic Park at the cinema nine times…that’s how obsessed I was. 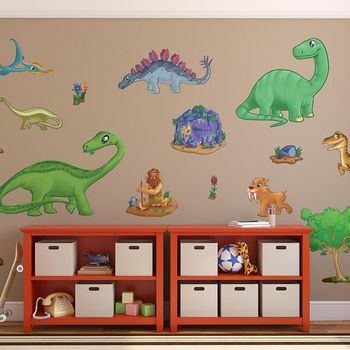 Here is a selection of some pretty awesome Dinosaur wall art stickers from over the web. Enjoy! How brilliant is this? Scary! 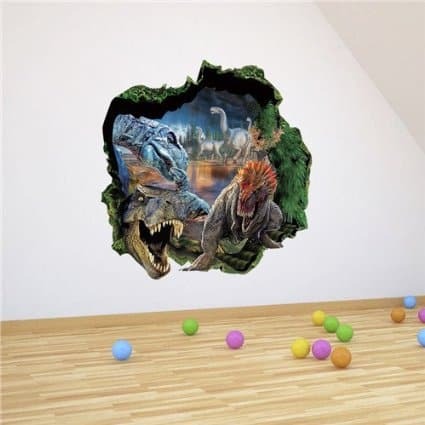 This Dinosaur wall sticker has a very realistic 3D effect, plus the cracked wall appearance around him, which just adds to the realism of it. Not sure how a young child might feel waking up to that in the night, but certainly for older children, this would be a cool option in a Dinosaur themed bedroom! This website, (lightinthebox) also has several other similar styles available with different dinosaurs, so it’s worth a look. Fighting Dinosaurs With Cracked Wall Effect Wall Sticker. 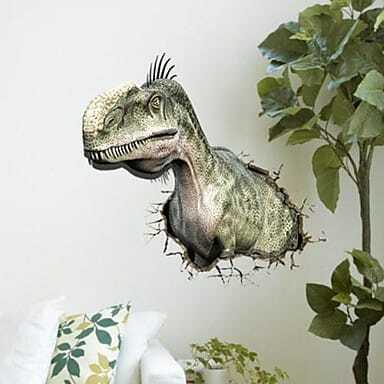 Another pretty scary 3D dinosaur wall sticker – with hole in the wall effect. 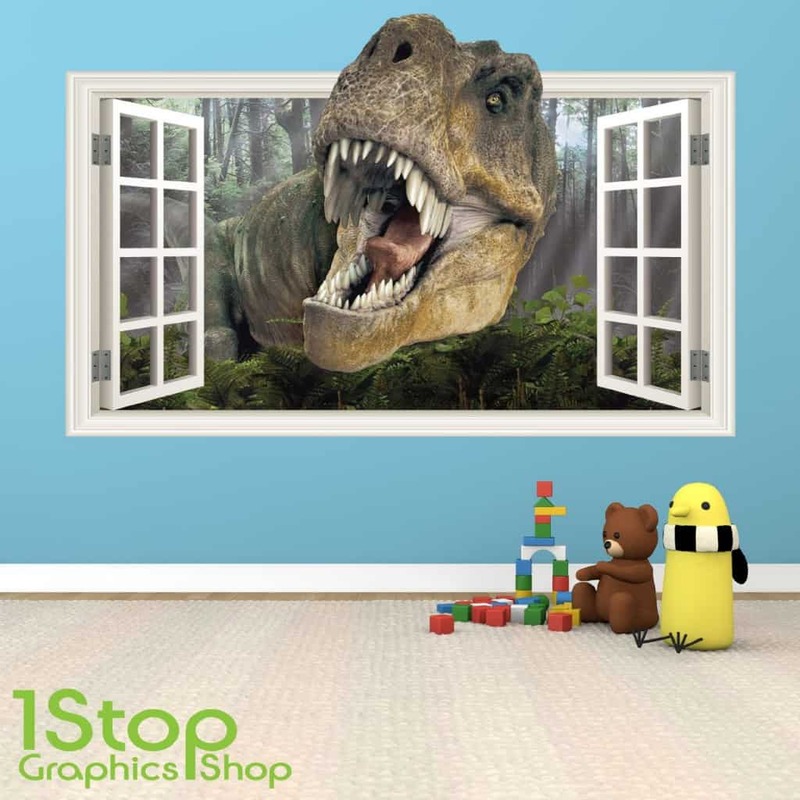 Giant TREX Open Window Effect Wall Sticker. EEEEkk…. Trex is coming through the window. Dimensions – large wall sicker, the width is 60cm. 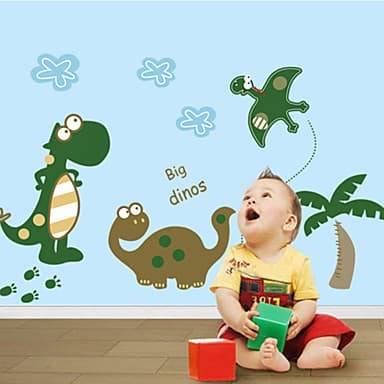 Cracked Wall Effect Wall Sticker With Large And Baby Dinosaur. 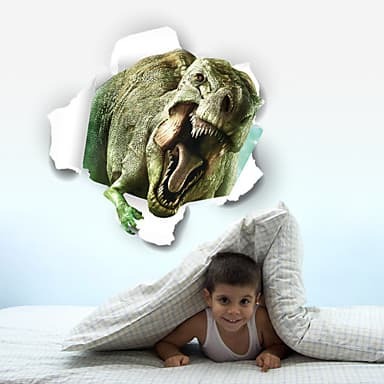 Another amazing Dinosaur wall sticker and this one looking as it has a little dinosaur trying to escape into your room! Very cute – Super detailed and realistic. Dimensions – Small 70cm (W) x 45cm (H) Medium 90cm (W) x 58cm (H) Large 108cm (W) x 70cm (H). Here are some cute decorative dinosaur wall stickers, perfect for a nursery and amazing value – currently on offer for under £7. Dimensions – Dinosaurs are 50*70*0.1cm (27.5*19.6*0.039inch). Large Dinosaur Wall Sticker Selection Variety. This is a really lovely selection of Dinosaur Wall Stickers. Dimensions of each sticker is as follows – the Brontosaurus is 57cm x 54cm, the Diplodocus is – 82cm x 53cm, the Stegosaurus is- 57cm x 28cm, the Quetzalcoatlus is- 46cm x 28cm, Velociraptor – 52cm x 37cm, the Sabertooth Tiger is – 29cm x 24cm, theCaveman is – 31cm x 30cm, Leafy Tree – 46cm x 47cm, Fire – 21cm x 29cm, the cave is- 34cm x 30cm, the large Rock is – 30cm x 18cm, the small Rock is- 20cm x 12cm, and the 2 Flowers are- 10cm x 13cm. Dinosaur Chalk Board Wall Stickers. 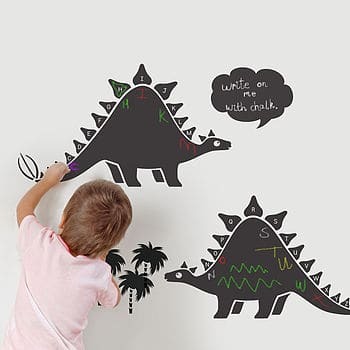 These dinosaur wall decals are pretty special! Not only do they look great, but they double up as a chalkboard, so your kids can draw on them too. I do love the whole idea of chalboard wall stickers or wall paper – kids are always keen to draw on the walls, so why not give them some freedom to do so! 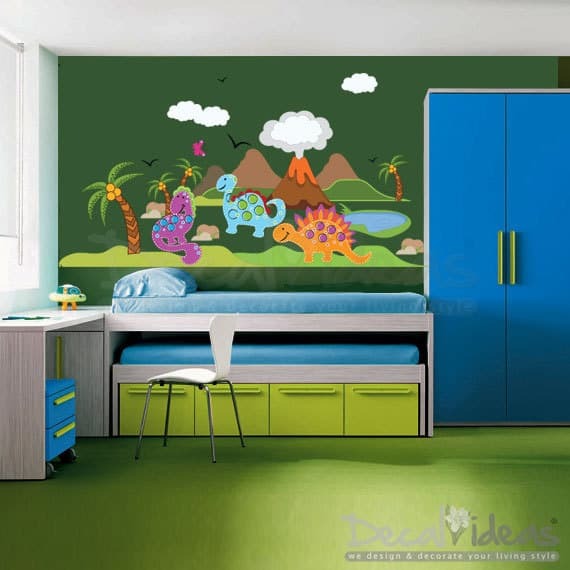 Dinosaur Wall Sticker Scene With Volcano. 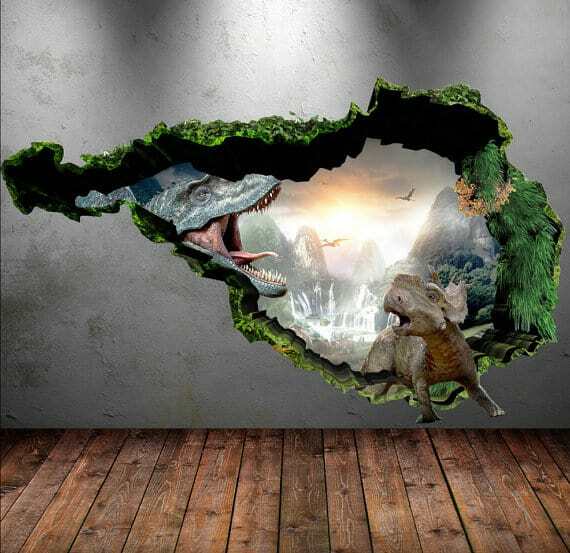 This is a gorgeous Dinosaur wall sticker scene, with a super volcano there right in the middle! Plenty of individual stickers, so your child can really make the scene their own and be creative with it. 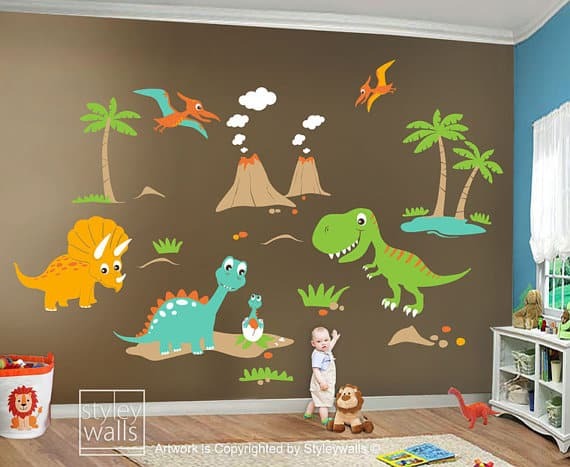 Dinosaur Scene With Multiple Wall Stickers and Volcano’s. Another really gorgeous Dinosaur wall sticker scene, perfect for a nursery or small child’s bedroom. Able to customise any of the colours and details – just ask! Super Scary TREX Wall Sticker. Wow…. this is an especially scary TREX wall sticker. For those kids who love the SUPER scary dinosaurs, this will be a brilliant one for them.